Swiftly arranged quality cleaning and high-level customer service. Start working as a domestic worker. Aim for customer satisfaction and enjoy your work! Home Works provides fully tailored housekeeping services. A reliable, screened domestic cleaner and a personal contact person to arrange your requested services. You pay per hour worked, VAT inclusive and without hidden or additional charges. Our services are amongst others: cleaning, gardening, preparing a meal, grocery shopping. Comfort services - as convenient as it sounds! 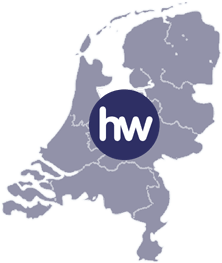 Our contact persons work from several offices providing services for all areas of the Netherlands. Join us at Home Works! Home Works is a cooperation of domestic workers. We aim for high customer satisfaction. Your coordinator will work together with you to ensure a smooth rendition of services, not only for the customer but also for you. We work from several offices but you will have a personal contact person. Together we provide you with good work. That’s why people choose Home Works! Regular domestic cleaner and contact person. Your contact person discusses your wishes with you and finds a regular domestic cleaner for you. We work together with the domestic cleaner to ensure quality by performing regular quality controls. Replacement in case of sickness or holidays and one week notice for cancellations or ending of services. With our comfort services we, Home Works, aim to make life a bit easier for our customers and we ensure continuity for both our customers as our domestic cleaners. If for example your regular domestic cleaner isn’t able to come due to sickness or holiday, we arrange replacement. For cancellations and/or ending of services one week notice is necessary. Payment is possible through online bank transfer (IDEAL), pre-authorized debit or wire transfer. You will receive a monthly invoice at the end of the month and you can check your administration in your online account. Perhaps you are eligible for a government subsidy? Take a look at the possibilities provided by the government at diensten aan huis op basis van PGB. That’s why you work as a domestic cleaner for Home Works! Your coordinator ensures a smooth rendition of services to your customers but also looks out for you. We aim to ensure a constant provision of clients, and a guarantee of payment. We take care of your administration. Monthly payment of salary and possibility of inscurances for payment in case of unemployment (WW) or disease (ZW). Payment in case of sickness or holidays. You can earn, dipending on the type of service delivered, from 11,85 euro bruto per hour worked. You can choose to set a percentage of your income aside, to save for payment in case of sickness or holidays. We ensure continuity of services. Our aim, as an association of domestic cleaners, is to smoothly organise comfort services for all involved. Which means both for our domestic cleaners as for our customers. Let us know that you are looking for work. I would like to bring my current customers with me. mail us call 0800-2003 F.A.Q.